Taking care of your child’s mouth begins in infancy. It’s a good idea to gently wipe your baby’s gums after feeding. Use a soft brush, specifically designed for babies, which fits over your finger tip. Even a clean, damp washcloth will do. If you get your child used to the idea of oral hygiene after meals from a very early age, it will be much easier to brush their teeth without resistance later on, when the teeth begin to appear in the mouth. Teeth begin to appear at around six months of age, and keeping them free of food deposits and bacterial plaque by brushing after meals can reduce the amount of inflammation that occurs around them. Concentrate on the areas where the teeth are breaking through the gums. This will make teething less painful for your child. The important thing to understand about childrens’ teeth is that most dental problems can be avoided through prevention. Learning some basic skills for taking care of your child’s teeth, and what to expect from their dental development is generally the goal of early dental visits, and is often referred to as anticipatory guidance. 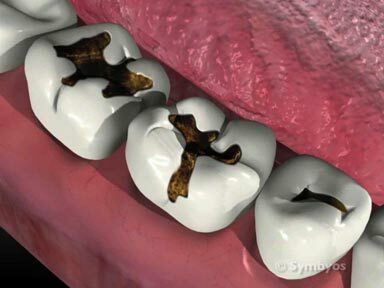 Tooth decay (also called cavities and dental caries) is a bacterial illness that destroys the teeth by dissolving them in acids—like those produced by Streptococcus mutans bacteria as a byproduct of sugar metabolism. However, acids found in fruit juice, soda pop, and other dietary sources can dissolve tooth structure directly. Minimizing the child’s exposure to carbohydrates (including breads, cereals and pastas) and acids is the most important step that can be taken to avoid cavities. When such foods are ingested, removing the acids and restoring the normal mouth pH is very important to prevent cavities from occurring. Early dental visits can be useful to demonstrate how best to take care of your child’s mouth and teeth. It is important that babies and young children not be put to bed with a bottle containing anything but water. Milk and fruit juice produces a phenomenon called baby bottle tooth decay. This is also called nursing caries and bottle rot. There is controversy surrounding this question, because the answer depends to some extent on the background and dental knowledge of the parents, and the training and philosophy of the dentist. Some dentists recommend that the parents have the baby’s mouth examined in the first year of life. Some of those dentists recommend looking before the teeth begin to erupt; others recommend waiting until the teeth begin to erupt. Still other dentists recommend that a dental examination be performed when all the teeth have erupted—around age two-and-a-half to three. It is important to take care of any decay in your child’s mouth as soon as it is identified. Extensive tooth decay in children that results in premature loss of teeth can lead to unnecessary pain and infection; and problems with the bite as the permanent teeth move into improper locations in the jaws. Abnormal tooth position can cause excess wear on the permanent teeth, difficulty performing oral hygiene, more problems with tooth decay, gum disease, and problems with the jaw joints. In addition, crowded, rotated teeth may produce esthetic concerns which can affect social development. Tooth decay in children is normally treated the same as in adults. The decay is removed from the tooth, and the missing tooth structure is filled with any of a variety of dental restorative materials. 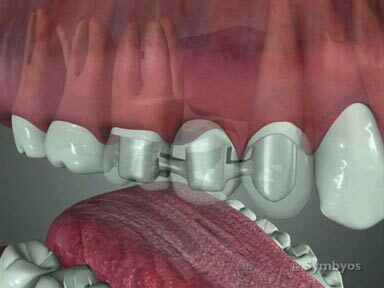 Options generally include fillings (silver amalgam, composite resin and glass ionomer), and prefabricated crowns (generally made of stainless steel or plastic). If your child has teeth which develop in a position that is tipped forward or backward significantly from normal alignment in the dental arch, have them evaluated by a dentist or orthodontist as soon as feasible. 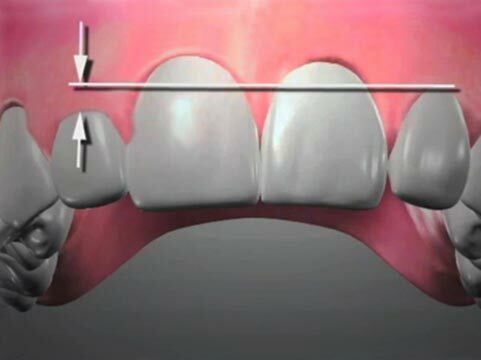 It is often possible to return the teeth to near normal position with simple “active” retainers or other orthodontics that use springs and/or wires to apply gentle tipping forces to the malpositioned teeth. Protect the teeth with an athletic mouth guard during all sporting activities that have the potential to cause dental injuries. It is important to realize that regardless of whether short term success is achieved through treatment of injured teeth, the likelihood of developing future problems (e.g. abscess, pulp space obliteration, external resorption, internal resorption) is greater for injured teeth than for uninjured teeth. This is true even after several years have passed without complications. This page was last updated on July 2, 2015.